From Joe Cowley of the Sun-Times to [my boss] Jason McIntyre to Zach Lowe to now Business Insider (??? 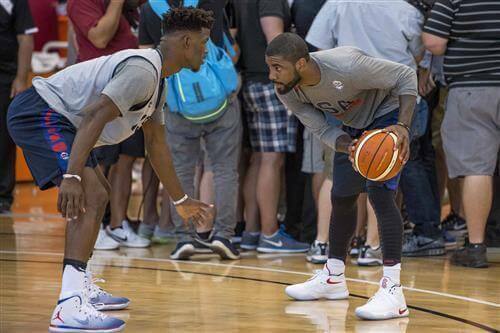 ), there’s been a lot of chatter about how Jimmy Butler and Kyrie Irving could team up together next season, possibly in New York with the Knicks or Nets. If this is where you’re hinging your hopes as a fan of either of those two franchises, you’re in for more years of profound disappointment. Butler has missed 15 games in four of his last five seasons, including last year when opted for a meniscus surgery that enabled him to return for the playoffs instead of undergoing a full-blown repair. I know superstars are at a premium in the NBA, but do you really want to be on the hook for the back-end of his next max contract?